Bikmo is a cycling insurance company 'run by bike geeks'. I have produced several illustrations for Bikmo, a mix of vector based illustrations for their website or promotions along with some rough sketches to set the scene for events. The image above was the final image used by Bikmo as an email advert to promote their work with Brompton. I was asked by the client to illustrated both a brand new box fresh Brompton alongside a well used muddy bike. This was a first draft, before we decided to simplify the image. This is a simple sketch I was asked to put together to demonstrate the set up for an event Bikmo were hosting in collaboration with cycle hoop bike hangers. The theme was #makeyourselfathome and the idea was to set up a living room vibe around the bike hanger for a promotional event. 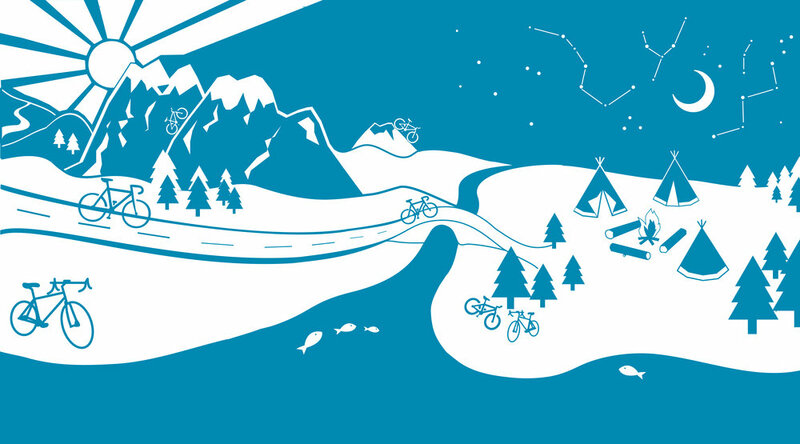 This vector style graphic was used to promote a cycling adventure on the Bikmo website. I was asked to illustrate a scene which shows both road and mountain biking from daytime to night time, with a little campsite at the end. I used illustrator to draw this scene.